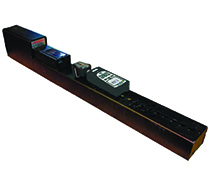 The TT Series pneumatic tester for measuring breaking strength is ideal for areas where intrinsic safety is required. This pneumatic tester is available in two models: one with a foot-actuated switch and one with a hand actuated switch. The Chatillon TT Series is a pneumatically-operated tester for measuring breaking strength of electrical leads, terminals, connectors, wire wraps, etc. When used with a mechanical gauge, it is ideal for areas where intrinsic safety is required. This pneumatic tester can be used for tensile or compression testing. The rapid test speed makes it ideal for production line testing, incoming inspection testing, or for the R&D laboratory. The pneumatic tester features a 6-inch (15 cm) test stroke and Ram speed may be controlled as low as 0.1-inch (2.5 mm) per minute. The tester operates using clean, dry air with a maximum air pressure up to 160 psig (11.2 bar). It meets MIL-T-7928 (ASG) requirements for crimped, solderless lugs. The TT Tester is available in two models: one with a foot-actuated switch, and one with a hand-actuated switch. Request more information to see how we can help you with a pneumatic testing solution that suits your need.